STUDENT The afterschool program will be in Mrs. Cool’s room today. Track Meet today at home. Anyone interested in playing IESA golf, please see Mr. Campbell. STUDENT The afterschool program will be in Mrs. Pickerill’s room today. Anyone interested in playing IESA golf, please see Mr. Campbell. CSI today during lunch. Kevin Purdy will be here. STUDENT The afterschool program will be in Mrs. Pickerill’s room today. Friday, January 15th is the end of the nine weeks. Report cards go out Thursday, March 21st. STUDENT The afterschool program will be in Miss Wahlfeldt’s room after school. Scholastic Bowl meet at Armstrong. Please dismiss players 2:55. Bus leaves at 3:00. Don’t forget that Fun Night is this Saturday and it starts at 4:00 p.m. Come and enjoy the inflatables and the auction starts at 6:00 p.m.
STUDENT The afterschool program will be in Mrs. Pickerill’s room after school. No Board Club game today. Scholastic Bowl meet at Oakwood. Bus leaves at 3:00. Please dismiss team members at 2:55 p.m.
STUDENT EARLY DISMISSAL AT 11:40 TODAY FOR SCHOOL IMPROVEMENT. No Board Club game on Monday. 8th grade volleyball will play tomorrow at 10:00 a.m.
STUDENT EARLY DISMISSAL AT 11:40 TOMORROW FOR SCHOOL IMPROVEMENT. EAGLE HOUR SCHEDULE TODAY! DETENTIONS TODAY. REPORT TO MR. FOSTER’S ROOM AFTER SCHOOL. The after school program will be in Mr. Packard’s room today. Scholastic Bowl bus leaves at 2:45 today for Chrisman. STUDENT EARLY DISMISSAL AT 11:40 THIS FRIDAY, MARCH 1ST FOR SCHOOL IMPROVEMENT. The after school program will be in Mr. Packard’s room today. Today, Wednesday, February 27, during lunch in Mr. Weaver’s room for 7/8 and the library for 5/6, CSI will be meeting. Travis Anderson will be our speaker. STUDENT EARLY DISMISSAL AT 11:40 THIS FRIDAY, MARCH 1ST FOR SCHOOL IMPROVEMENT. The after school program will be in Miss Wahlfeldt’s room today. 8th Grade Volleyball plays at St. Joe at 7:00. Bus leaves at 5:00. STUDENT The after school program will be in Mrs. Pickerill’s room today. Track practice begins today. Practice time is afterschool until 5:00 p.m. Bring clothes for inside and outside. Please turn your box tops into the library. 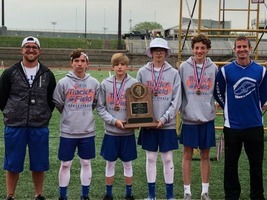 The 7th grade play the regional today at St. Joe at 7:00 p.m.
STUDENT The after school program will be in Mr. Packard’s room today. Progress reports due today!! 7/8 Volleyball game vs. Armstrong-Potomac – Home – 6:00 p.m. Spelling Bee finals are tonight at 6:00 p.m. at DACC. Track practice begins on Monday. Bring clothes for inside and outside. STUDENT The afterschool program will be in Miss Wahlfeldt’s room today. 7th Grade Volleyball – Home – 6:30 p.m. 7/8 Boys Basketball pizza party at lunch time Thursday, February 14th. Progress Reports go out February 15th. STUDENT The afterschool program will be in Mrs. Pickerill’s room today. 7/8 Volleyball – Home - 6:00 p.m. Progress Reports go out February 15th. EAGLE HOUR TODAY! We are on a shortened bell schedule. No afterschool program today. 8th Grade Volleyball at Georgetown High School tomorrow. Bus leaves at 9:00 a.m. Today is the end of the midterm. Progress Reports go out February 15th. STAFF HOMEWORK REQUEST –Lilly Trimble – Please send work to the office by 1:00. STUDENT The afterschool program will be in Miss Wahlfeldt’s room today. 7/8 Volleyball at Rossville at 6:00 p.m. Tomorrow is the end of the midterm. Progress Reports go out February 15th. STUDENT The afterschool program will be in Mrs. Pickerill’s room today. 7/8 Volleyball at PVO at 6:00 p.m. Bus leaves at 4:45 p.m. Pre-season Track store has been extended until tomorrow. Check out the Junior High Facebook page to order. Friday, Februay 8th is the end of the midterm. Progress Reports go out February 15th. STUDENT EARLY DISMISSAL THIS FRIDAY, FEBRUARY 1ST. AT 11:40 FOR SCHOOL IMPROVEMENT. The afterschool program will be in Mrs. Pickerill room today. 8th grade regional basketball game – Home – 7:15 p.m. 7TH Grade Volleyball team plays at Westville at 6:00 p.m. Bus leaves at 4:45. STUDENT Bismarck-Henning 7th Grade Basketball Regional at 5:00 p.m. in the junior high gym against Judith Christian. 7th Grade Regional for Saturday at 10:00 a.m. Winner of tonight’s game plays Villa Grove. 8th Grade Basketball plays St. Anne Saturday at 12:45 p.m. 8TH graders turn in your Jostens’ envelope today. STUDENT The afterschool program will be in Mrs. Head’s room today. Reminder: 7/8 scholastic bowl practice after school till 4:15 in Mrs. Leigh’s room. Bring something to write with. 8TH graders turn in your Jostens’ envelope. STUDENT The afterschool program will be in Mr. Weaver’s room today. Today, Wednesday, January 23, CSI, during lunch in Mr. Weaver’s room, CSI will be watching the fourth video in the Surrender Series, “Surrender Self.” Everyone is invited. 5/6 will meet in the library. 8TH graders turn in your Jostens’ envelope. STUDENT The afterschool program will be in Miss Wahlfeldt’s room today. There will be no 5th/6th grade scholastic bowl practice today. There will be practice on Thursday. 7th grade boys’ basketball regional – Home – 6:00 P.M. & 7:15 P.M. 8TH graders turn in your Jostens’ envelope. STUDENT Congratulations to the 7/8 girls’ volleyball teams for their win last night. Today, Wednesday, January 16, during lunch in Mr. Weaver’s room, CSI will be watching the third video in the Surrender series. Reminder: Turn in you signed report card envelopes. The afterschool program will be in Mrs. Cool’s room today. EARLY DISMISSAL WEDNESDAY, JANUARY 9TH AT 2:10. REPORT CARDS GO OUT FRIDAY, JANUARY 11TH. STUDENT EARLY DISMISSAL TODAY AT 2:10 FOR CHRISTMAS VACATION. MERRY CHRISTMAS!!! 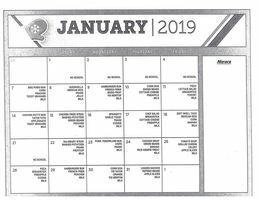 SCHOOL RESUMES ON JANUARY 7, 2019. STUDENT Wreath Across America is December 15th. If you would like to help with the laying of wreaths, please see Mr. Campbell. THE BISMARCK WOMEN’S CLUB IS SPONSORING COATS AND PANTS FOR KIDS: Fair Hope Children’s Ministry needs coats and pants to give to the area children. Your donation of new or used coats would be greatly appreciated. STUDENT REMINDER: If you need a lunch card, pick it up before lunchtime. Cheerleaders turn in your t-shirt money to the office. The junior high is collecting new unwrapped toys for Toys for Tots. The box is in front of the office and the collection date ends December 6th. Progress Reports go out today. STUDENT EARLY DISMISSAL TODAY AT 2:10 FOR PARENT-TEACHER CONFERENCES. NO SCHOOL TOMORROW DUE TO PARENT-TEACHER CONFERENCES. DETENTIONS TODAY. REPORT TO THE OFFICE AFTER SCHOOL. PICTURE RETAKES WILL BE MONDAY, OCTOBER 22ND. Report Cards will be handed out at Parent-Teacher Conferences or sent home Monday morning. STUDENT NO SCHOOL TOMORROW DUE TO TEACHERS’ INSTITUTE. NO SCHOOL MONDAY, OCTOBER 8TH IN OBSERVANCE OF COLUMBUS DAY. The after school program will be in Mrs. Cool’s room today. STUDENTS The after school program will be in Miss Wahlfeldt’s room today. 7/8 Girls’ Basketball Game – Home – 6:00 p.m. Turn in your progress reports before Thursday. STUDENTS The after school program will be in Mrs. Pickerill’s room today. Turn in your progress reports ASAP! STUDENTS Congratulations to the 7/8 girls’ basketball team for their win last night. STUDENTS The after school program will be in Miss Wells’ room today. 7/8 Girls’ Basketball game – Home – 6:00 p.m. Please turn in your Handbook Acknowledgement forms to the office. ASAP! STUDENTS EARLY DISMISSAL AT 11:40 TOMORROW FOR SCHOOL IMPROVEMENT. The afterschool program will be in Miss Wahlfeldt’s room today. Please turn in your Handbook Acknowledgement forms to the office. ASAP! STUDENTS EARLY DISMISSAL AT 11:40 ON WEDNESDAY, SEPTEMBER 19TH FOR SCHOOL IMPROVEMENT. The afterschool program will be in Mrs. Pickerill’s room today. Please turn in your Handbook Acknowledgement forms to the office. ASAP! Please turn in box tops to the library. STUDENTS. The afterschool program will be in Miss Wells’s room today. Please turn in your Handbook Acknowledgement forms. 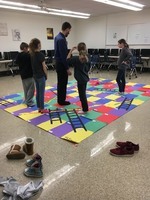 STUDENTS The Board Game Club with Mr. Click starts after school next Monday in the Library. If you are interested in joining, make sure to get a permission slip from Mr. Click and have it turned in before Monday. STUDENTS NO SCHOOL ON MODAY, SEPTEMBER 3RD IN OBERVANCE OF LABOR DAY. 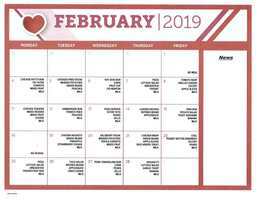 Students that have books on hold in the library: Addisyn Thomas Students: If you need a new lunch card, please let the office know in the early morning before lunch. Please turn in box tops to the library. STUDENTS Please turn in box tops to the library. If you are in 7th or 8th grade this year and bought a 17 – 18 yearbook, please see Mrs. Cotton in the afternoon this week. There are a few extra for sale for $18. STUDENTS SCHOOL RESUMES REGULAR 3:15 DISMISSAL TODAY. Basketball practice begins today after school. Please turn in box tops to the library. If you are in 7th or 8th grade this year and bought a 17 – 18 yearbook, please see Mrs. Cotton in the afternoon this week. There are a few extra for sale for $18. STUDENTS EARLY DISMISSAL THIS WEEK AT 2:10. SCHOOL WILL RESUME REGULAR SCHEDLUE ON MONDAY, AUGUST 27TH AT 3:15. Basketball permission slips are due tomorrow. Practice begins Monday after school. If you are in 7th or 8th grade this year and bought a 17 – 18 yearbook, please see Mrs. Cotton in the afternoon this week. There are a few extra for sale for $18. STUDENTS EARLY DISMISSAL THIS WEEK AT 2:10. SCHOOL WILL RESUME REGULAR SCHEDLUE ON MONDAY, AUGUST 27TH AT 3:15. If you are in 7th or 8th grade this year and bought a 17 – 18 yearbook, please see Mrs. Cotton in the afternoon this week. There are a few extra for sale for $18. STUDENTS EARLY DISMISSAL THIS WEEK AT 2:10. SCHOOL WILL RESUME REGULAR SCHEDLUE ON MONDAY, AUGUST 27TH AT 3:15. Picture day is tomorrow. If you are in 7th or 8th grade this year and bought a 17 – 18 yearbook, please see Mrs. Cotton in the afternoon this week. There are a few extra for sale for $18. 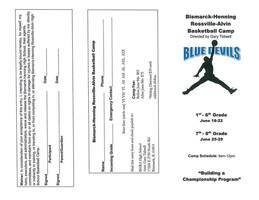 Blue Devil Basketball Camp flyers will be coming home with your students soon! Camp is open to all Bismarck-Henning and Rossville-Alvin students going into grades 1-8 for the 2018-19 school year. See the attached flyers for more information.